If you spend a lot of time traveling or if your work requires extended periods of standing, you have probably experienced associated leg fatigue and swelling. Compression socks can be a great way to help combat this type of discomfort. Comrad offers a terrific selection of compression socks that look great while also providing outstanding support. Comrad compression socks are made with fabric that is both anti-microbial and breathable, and they provide what the company refers to as "true graduated compression." These socks are designed to help "energize" your feet and legs while also reducing swelling and soreness in situations that require extended periods of standing or sitting. I am a professional trainer, so I am a frequent business traveler who spends a lot of time on her feet. When I am not on a plane or in a car, I spend a lot of time presenting all-day workshops or speaking at conferences, both of which involve long periods of standing and walking. With that in mind, it shouldn't be surprising that I am always on the lookout for ways to reduce or relieve leg and foot discomfort. That's why I am a fan of compression socks, and the main reason I jumped at the opportunity to check out Comrad's line when they offered to send me a few samples to check out for review purposes. These socks do a great job providing the many benefits associated with compression, including reducing leg swelling and fatigue related to extensive travel and standing. I recently wore them on a fairly long road trip and to teach a workshop, and did find that my legs were less fatigued at the end of the day than usual. I will definitely use them again, and would recommend them to people whose work also requires these types of activities. Comrad compression socks are available in several colors, including various shades of gray, navy, black, red and more. The line includes solid color, graduated tone, and striped styles. I really like the variety of available colors, as it's easy to find options that coordinate well with just about any type of pants or slacks. There are fun striped options to wear with jeans and sneakers or workout gear, as well as neutral tones that coordinate well with professional attire and apparel designed for business travel. The socks in this line are unisex. All colors come in size medium, which fits women who wear sizes 7 to 11 1/2 and men who wear sizes six to 10 1/2. Some colors are also available in small and medium sizes as well, so there are options for people with shoe sizes outside these ranges. 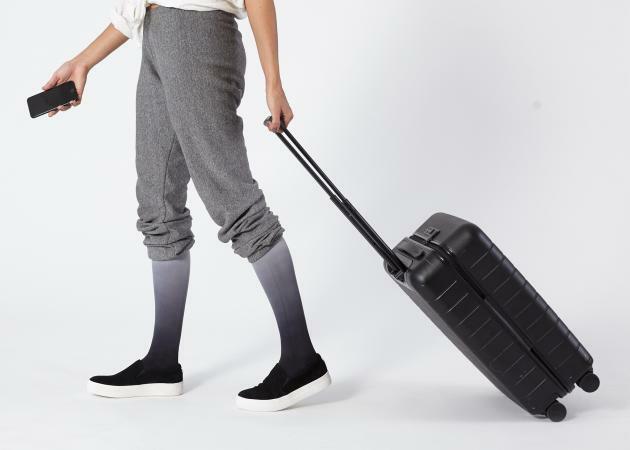 Priced between $18 and $21 per pair, these socks provide a low-cost way to help reduce the fatigue, swelling and discomfort often associated with travel and other activities that requires extensive standing. If you're frequently on-the-go or on your feet, you just might find them to be quite beneficial.